Big. Wheels. They are the coolest things to kids and the toughest things to ride as adults. The Biggest Big Wheel library will take you on a trip down memory lane to the time you rode your big wheel to the park with your friends or that time you decided to try and ride it to the corner store. 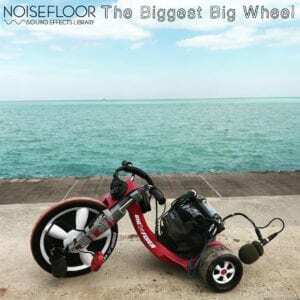 This library includes general riding sounds on grass, gravel, pedal movement, and more! All 52 files are 96kHz /24-bit WAV and are all ready to be placed in your project! Gear Used: Sound Devices MixPre 6, 2 Neumann 184s, Zoom H6 – XY.